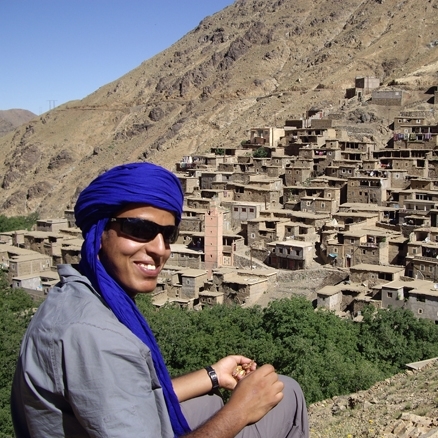 A unique trek, avoiding the busiest trails, to North Africa’s highest peak - Jebel Toubkal. I enjoyed the opportunity to undertake such an amazing route far from the tourist areas. Also, having a hard working and very knowledgeable guide who could give me a deep insight into Berber culture, organised every aspect of the trip excellently and was very helpful. Interesting trek, seemed like an excellently judged itinerary. Good company, excellent trip leaders, trekking cook and team. We had a great trek and overall the holiday and arrangements were superb- I think it was the best written briefing we have ever had. A trek up Jebel Toubkal, 4,167m/13,671ft, is the main, but by no means the only objective on this great trekking holiday. Whilst some may be content just to ‘bag’ North Africa’s highest peak, our unique High Atlas trekking itinerary avoids the busiest trails and immerses you in the land of the Berbers. Leaving Marrakesh we make a short drive to a valley in the heart of the High Atlas to begin our traverse of the Toubkal Massif. We trek from the east through isolated valleys, crossing high passes and camping in high pastures or by rushing streams. In the village of Amsouzerte we enjoy the added comfort of a local gite (mountain refuge) before continuing our High Atlas trekking via the turquoise waters of Lac d’Ifni to cross the Tizi n’Ouanoumss pass at 3,664m/12,012ft. If you want to see the best of the Moroccan High Atlas, trekking to Toubkal with Mountain Kingdoms is the perfect way to do it. Call us now on 01453 844 400 to arrange an unforgettable Moroccan adventure. Fly to Marrakesh. Transfer to a Riad in Marrakesh. Drive to Setti Fatma and begin the trek. Walk through terraced farmland and villages rarely visited by tourists. Trek to Lac d’Ifni and over the high pass, Tizi n’Ouanoumss, 3,664m/12,022ft, to the Neltner Refuge. Trek to Tizi Oussem via the Aguelzim. Continue on to Tessa Ouirgane and end trek. Drive to Marrakesh. Tour of the souks. Transfer to Marrakesh airport for flight to UK. Day 1 - Fly to Marrakesh. Group transfer to hotel. Day 2 - Drive to Setti Fatma - 1½ hours. Trek to Assaka, 2,100m/6,890ft - 5 hours. After breakfast you board your transport for the 1½ hour drive to the trailhead. For 45 minutes, the road south crosses the empty plains, the outline of the High Atlas becoming gradually more apparent. After another 15 minutes there is a turn off to Oukaimeden, Morocco's largest ski area, and then it is half an hour through the increasingly lush Ourika valley to Setti Fatma. This trailhead at the eastern end of the High Atlas has always been popular with the Moroccans but foreign tourists traditionally have centred around the increasingly busy town of Imlil. The fertility of the valley is immediately apparent with stores selling boxes of apricots, plums, melons, cherries, oranges and apples. You will probably go on another kilometre to end of the track at Agadir n-Ait Boulmane, 1,498m/4,915ft, to pick up the mules. This is a most attractive Berber village, busy with women returning from the fields laden with bundles of long grass for the cattle. From here it is about a five hour walk to your first camp. The valley from here to camp at Assaka is along what the locals refer to as "the gorges". The locals are happy to wander along the valley bottom enjoying the shade of the trees, the running water and the socialising. Of course this means a lot of walking along the sides of irrigation channels, hopping from boulder to boulder, and crossing bridges made of little more than sticks and rocks. For you, the mule path is a better option, climbing well up out of the gorges and giving you your first views of the surrounding landscape. Soon after the mule track climbs high up on the left hand side of the valley. The Berber village of Tamatert, 1,655m/5,430ft, is reached after another hour or so. The route up to the Tizi n'Tamatert is now very apparent, winding up through increasing numbers of Juniper trees, and brings you to a pass on a rocky ridge with fine scrambly viewpoints. From here, the short trek back down into the valley is clear, as is tomorrow's climb back up and over the Tizi (col) n'Amenzil. It is only half an hour down to camp where the muleteers will be set up, and ready to greet you with a glass of Berber mint tea! Day 3 - Trek from Assaka to Azib Tifnoute, 2,417m/7,930ft - 6½ hours. There's an interesting start to today's trekking as you pass through the village of Amenzil before a long climb up to Tizi n'Imchichki, 2,981m/9,780m, and then a steep drop all the way back down to 2,400m/7,874ft. It is an hour up to Tizi Amenzil, climbing quickly through juniper trees, whilst the view of yesterday's walk opens up. The first col isn't quite the top, that comes five minutes later with a fine view of the village of Amenzil just a few minutes away, and a long green terraced valley stretching out beyond. Amenzil is rarely visited by tourists, and you may be invited into one of the houses to share mint tea, walnuts and bread dipped in olive oil. Beyond the village the path climbs steadily up the right hand side of the valley for 45 minutes, following the irrigation channels that come down from the mountains. The fields are full of women working and further up the teenagers will be out herding goats. The valley becomes more barren after the end of the cultivation, and you stop at a small azib (summer goat herders' huts) for lunch below the col at the head of the valley. From here it is an hour to the Tizi n'Imchichki, with 15 minutes on the level before the descent starts. It is almost 600m/1,968ft down to the riverside at Azib Tifnoute. It is a classic Moroccan descent, dry and loose, on which you can descend very quickly if you enjoy scree, or very slowly if you don't!! It'll be around 2 hours before you emerge through the summer villages and out to camp by the riverside. As you head back to your tent after dinner watch out for the giant toads that hop around the rocks! Day 4 - Trek to Azib n'Ououraine, approximately 3,000m/9,842ft - 4-4½ hours. Today you walk through the azibs (summer pastures) of this central High Atlas valley before turning south and climbing to 3,000m/9,842ft to a wild camp just below Tizi n’ Ououraine. A glance at a map reveals over a dozen ‘azibs’ in the stretch of valley through which you pass this morning. Given its altitude, the valley spends a large part of the year under snow, but come mid-May, hundreds of locals (and thousands of goats) leave their valleys both north and south and head here to the temporary settlements over the summer months. It is a fascinating place to be: it is only when high above that the extent of the terracing becomes apparent, and you see the vibrant green vegetation fed by man-made irrigation channels full of snow-melt. It is about 2 hours to Azib Tamenzift where the path turns off south. In June along the sides of the paths, red poppies and orchids add colour. There are two routes to Amsouzerte in the south. The old route via Tizi n’Terhaline and Tissaldai, is prone to landslides and lingering snow and is rarely possible for mules anymore. The more popular route now, and proving fine views south towards the Sahara, is to cross the Tizi N’Ououraine. From the turning it is about a 2½ hour walk up to tonight's camp. Even in June there may still be snow patches hiding from the sun. There are pleasant rock pools along the way and on a hot day these may tempt you into a discreet dip! The small pasture of Azib n’Ououraine where you camp appears suddenly. A short distance up the path through the scree beyond takes you to the pass you cross tomorrow. You are quite high now at 3,000m/9,842ft and it can be cold and windy once the sun has gone down. Day 5 - Trek to Amsouzerte, 1,797m/5,896ft, via Tizi n’Ououraine, 3,120m/10,236ft, 3-3½ hours. It is only 15 minutes to the col, 3,120m/10,236ft, from where you finally enter the southern side of the High Atlas. In clear weather there are fine views south over Jebel Sahro and the desert. Toubkal lies to the right and villages with their vibrant green terracing nestle in the valley below. It is 1,300m/4,265ft, of descent, but the path stays on the crest of the ridge all the way affording great views throughout. The descent can be done in 2½ hours, but it is worth enjoying it. Tagounite is the first village you descend into and in June the roofs of the houses will be covered in swathes of grass laid out to dry. You may be offered walnuts, or find bags of cherries for sale. You will find yourselves on a track leading into Amsouzerte: the ability to get fruit out to market has brought relative wealth to the valley. In Amsouzerte you will stay at a gite, have a chance to wash and relax on a roof terrace and watch life go on in the fields. The houses in Amsouzerte are substantial compared to the surrounding areas, often three, or four storeys high with fine views. They are still basic, however, with little more than carpets on the floors, a squat toilet and shower and some electricity. There are basic stores in town and you will find fizzy drinks, fresh orange juice and whatever fruit is in season. After lunch and a refreshing mint tea, the afternoon is free to enjoy the surroundings. You may want to follow the main track south out of the village. Forty minutes or so of walking takes you through several small villages and almost out of the mountains altogether as you emerge into the desert landscapes around Ouaounzourt and Imlil. You could return up the other side of the valley on the smaller paths. Day 6 - Trek to Azib Imi N’Ouassif, 2,700m/8,858ft, via Lac D’ifni, 2,312m/7,585ft, 5-5½ hours. Today's walk is all uphill, climbing from Amsouzerte via Lac d'Ifni for lunch and then on to Azib Imi n'Ouassif in the gorges beyond. The first hour out of Amsouzerte is wonderful walking through busy villages up the Ait Tissili valley. The well graded track passes through Takatert, Tisgouane and finally Tirhaltine. In spring the women are in the fields gathering bundles of grass that they carry on their backs. Well kept terraces are fed via water channels from Lac d'Ifni, hidden from view by what appears to be a dam of rocks. Poplars and willows thrive in this climate, as do the walnut and chestnut trees. Later in the season you can pick blackberries as you walk. Takatert is reached in just over an hour and there are several kiosks here that will sell you cold drinks in the shade of the nut trees. You follow the little path up through the village of Imhiliene joining the zigzags higher up. It is a strange sight as you reach the turquoise blue lake glinting in the sunshine. Current thought is that it was created not by moraine, but by massive rockslides. On the gravel plains on the far side are a few small stone shacks which are reached in the best part of another hour. Lunch is a welcome break.The more adventurous can enjoy a dip in the snow fed waters of the lake. It is possible to camp by the lakeside, but better to head up into the gorges for a while to make the ascent tomorrow easier. About 1½ hours up from the lake is a small azib with just enough room for 8 tents and your mess tent. It is a dramatic spot from where you can just about make out the notch in the horizon through which you pass tomorrow. Mouflon (wild mountain sheep) have been seen here in the past. Day 7 - Trek to Refuge Neltner, 3,207m/10,522ft, via Tizi n’Ouanoumss, 3,664m/12,021ft, 5-6 hours. From camp it is still almost a thousand metres to the col, but the height is gained quickly over a short distance. The path keeps well to the right of the valley avoiding the deepest parts of the gorge and as such the Lac remains out of view for most of the ascent until just before reaching the col. The top is reached in 2½ to 3 hours. There is a direct route on up the ridge to the summit of Toubkal from here, but it involves abseiling and is best left to the experts! The views from here are impressive. Up to the left at the head of the valley is Jebel Ouanakrim,4,088m/13,412ft, the second highest peak in the Atlas. Directly opposite is the ridge of the Clochetons with the prominent pinnacle of Tadat, 3,755m/12,320ft, in the middle. The descent from the col down into the upper Mizane valley is short and steep, but on a well-built zigzag path. It takes about half an hour down to reach the valley bottom and then another half an hour along the valley floor to the Neltner Mountain Refuge. A second refuge has been built here in recent years alongside the original French Alpine Club hut. This brings capacity in the huts alone to well over 200 people and the place always seems busy. There is also a new building for muleteers and even their mules have shelter downstairs for when it gets cold. We choose to camp on the terraces in front of the new hut. This allows us to enjoy the privacy of our tents (rather than large dormitories) whilst using the toilets and showers of the refuge. The afternoon can be spent relaxing ahead of tomorrow's summit bid. Day 8 - Ascent of Jebel Toubkal, 4,167m/13,671ft - 5-5½ hours. Our goal today is the ascent of Jebel Toubkal, 4,167m/13,671ft, the highest mountain in North Africa. It is traditional to make a start before 7am, not just to avoid ascending in the heat of the day, but also because clouds tend to build up around the mountain after midday, frequently obscuring the views. The route up via the south cwm is the normal route and is predominantly scree and boulder although they are reasonably firm underfoot. The route reaches a col, the Tizi n'Toubkal, 3,940m/12,926ft, in just over 2 hours, from where there are fine views south, and continues up just below the ridge summiting normally in just over 3 hours. The most notable feature of the summit is a large metal pyramidal structure. The views extend well south towards Jebel Sahro and Siroua and whilst in mid-summer they are usually restricted by heat haze, the spring and autumn are generally much clearer with cloud inversions common in September and October. The mountain can be descended in a couple of hours, returning the way you ascended. However, unlike many other groups on the mountain we have time to make a far more satisfying traverse of the mountain, descending via the north cwm. This is a much quieter route and passes the satellite peak of Tibherine, 4,010m/13,156ft, on which still lie the scattered remains of a light aircraft that crashed back in the 1970s. Owing to the early start, lunch will be back at camp followed by an afternoon relaxing. Day 9 - Trek from refuge to Tizi Oussem, 1,850m/6,069ft, via Aguelzim Ridge, 3,600m/11,811ft, 5½ hours. The vast majority of people who climb Toubkal descend on the main mule track, via Sidi Chamharouch, to the roadhead at Imlil. Your route out over the ridge of Aguelzim to the west provides access to the picturesque and well populated valley of Azzadene and the village of Tizi Oussem (1,850m/6,069ft). It is unusual in the Atlas Mountains to find a path in such good condition that traverses long stretches of hillside offering magnificent views north. Toubkal dominates the view. Further up, the route opens up to fine traversing stretches, passing several false summits before its high point on the Aguelzim ridge at 3,600m (11,811ft) after 1¾-2 hours. Besides the pinnacles of the Clochetons behind you, you have a full 360 degree panorama with the busy valleys of Aremd and Ouakaimeden ahead of you and Marrakesh in the haze beyond. Behind to the west is the Tazarhart plateau. Part of the path down can clearly be seen descending through the valleys towards the Lepiney Refuge. 15mins uphill will take you to the refuge, also known as the Tazarhart refuge, a French Alpine Club hut with bunks for 20, where you can buy fizzy drinks and water if the guardian is around, and enjoy them surrounded by a ring of 4,000M peaks. With 1,000m/3,281ft still of descent to Tizi Oussem, now clearly visible down the valley, the path continues to lose height quickly, passing the Cascades d' Irhoulidens and a surprisingly large waterfall tucked away in the gorge, and emerging into civilisation at the campsite and Azib of Tamsoult. This makes a good lunch spot with fine views, grassy terraces and cold drinks. After lunch, 3km of well graded path traverses the valley side for 1½ hours through juniper trees before reaching your goal for the night, your gite at Tizi Oussem. Just before arriving in town, you may see a small plantation of trees on the right where attempts have been made to reintroduce cedars to the area. After eight years the trees are still small and the project has been deemed a failure. The gite at 1,850m/6,069ft, in the centre of a busy village, enjoys sunshine on its terrace until late into the evening. The rooms, though basic, come with beds and electricity and there are hot showers and even a Hammam. As this is the last evening with the muleteers, it is traditional to have a small celebration and hand out the tips. Your crew will also organise a Mechui (a traditional slow roasted lamb or goat). Day 10 - Trek to Tessa Ouirgane - 5-5½ hours. The last day of walking sees the path descend gradually through the valley of Azzadene emerging in the west, near the town of Ouirgane. The route out of Tizi Oussem quickly picks up a dirt track heading down the right hand side of the valley towards the villages of Tahaliouine and Tiziane. This is the track that is used in the autumn to ship all the harvested apples out to market in Marrakesh. The track soon diverts off over the Tizi n'Techt towards Asni and your path continues on through the villages. After a couple of hours, the valley narrows and the path decends into a small gorge leaving the panorama of 4000m peaks behind you. The temperature is warmer and the vegetation different here. Below 1,500m/4,921ft oaks replace juniper, though the oaks are almost unrecognisable from ours. Olive trees abound and kids beat drums across the valley to scare the birds off the cherry trees. If you are walking this way in June, the Oleanders are in full pink bloom as the path traverses high on the side of the river valley. It is about 4½ hours walking to a suitable lunch spot by the side of the river. After a final Moroccan salad, it is just another 30 minutes round the corner to the end of your trek in Tessa Ouirgane, where a dirt track arrives from Ouirgane itself. Transport will meet you here and your muleteers will unpack your kit bags in readiness for their return home through the mountains. It is then a short 10-15 minute drive to a comfortable hotel, where you spend your last night in the Atlas Mountains in relative luxury. Day 11 - Drive to Marrakesh - 1¼ hours. Walking tour of souk - 2-3 hours. It is about 60km/38miles and just over an hour's drive back to Marrakesh. So even after a lie-in and a relaxed breakfast you are still back in town with plenty of time to explore. On arrival back in the city, you will take a guided walking tour of the maze-like souks. You will see the dyers' souk and the metalworkers' souk as you explore the narrow alleyways and backstreets of one of North Africa's most fascinating cities. A visit to an apothecary, although essentially an opportunity for the proprietors to sell you their wares, offers an interesting insight into the many herbs, spices and oils that Morocco produces. The 'offer' to buy usually follows a short presentation on the properties of the various concoctions but is markedly less hard-sell than that of the carpet shops - you have been warned! Although the souk is the place for souvenir and gift shopping you may wish to use this morning simply to get your bearings and learn a little about the essential art of haggling. This afternoon you are free to explore at leisure. Marrakesh has a number of interesting sights to see including Les Jardins Majorelle - Yves St Lauren's celebrated gardens; the Saadian Tombs and the Bahia Palace. As the evening draws in, you might enjoy a traditional steam bath in one of the many hammams, hidden down narrow side alleys, or take a caleche (horse drawn carriage) ride around the city walls and enjoy a freshly squeezed orange juice in the main square, the D'Jemma El Fna. As the sun sets, this enormous open area at the edge of the souks begins to fill with open air food stalls, story tellers, snake charmers and dancers. This nightly ritual of exotic sounds and smells draws locals and tourists alike. Take a wander through the crowds or enjoy people-watching from one of the cafes overlooking the scene. Day 12 - Group transfer to airport. Fly to London. This morning, after breakfast, you'll transfer back to the airport for your flight to the UK. We had a great trek and overall the holiday and arrangements were superb - I think it was the best written briefing we have ever had.